Should the German car brands like BMW, Mercedes and Audi be worried? 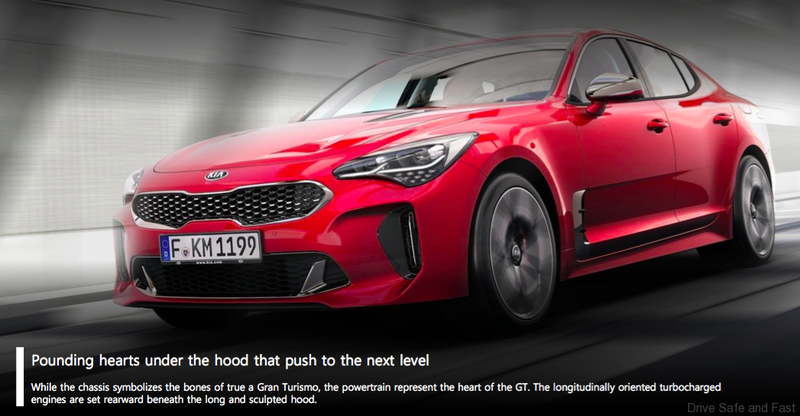 Well, Kia wants to challenge them with this all new sedan and they might just manage to make a dent in their egos when you look beyond the badge branding and just concentrate on the equipment, features and performance of the Stinger . 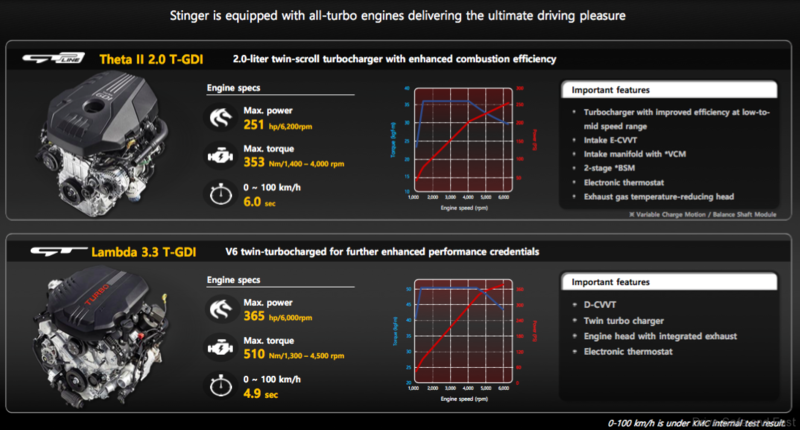 Kia in Malaysia has just launched the Stinger in 2 variants. 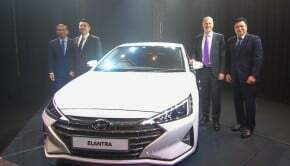 The 3.3-litre V6 GT variant goes for RM309,888 on-the-road without insurance while the 2.0-litre GT-Line variant is priced at RM239,888 on-the-road without insurance. 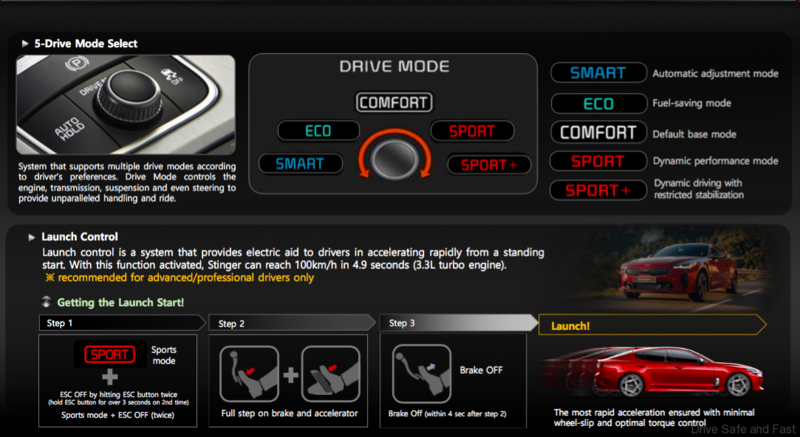 Here we offer 12 selling points that should get you keen enough to test drive the Stinger and maybe even buy one. 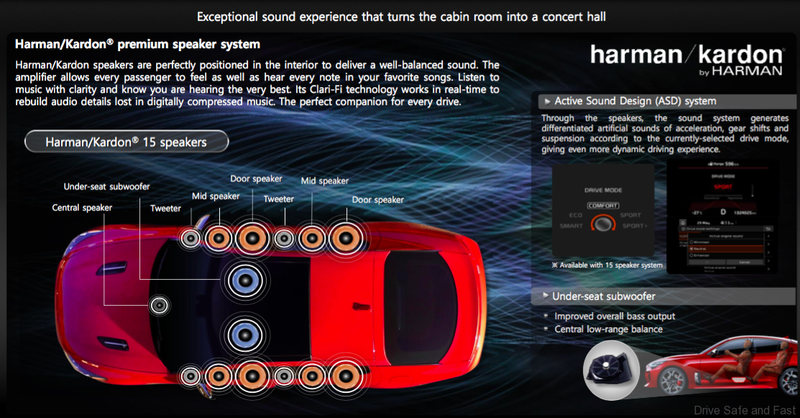 The Kia Stinger’s 15-speaker Harman Kardon premium speaker system further amplifies the dynamic driving experience of the Kia Stinger, accompanying occupants on the road with crisp sound clarity. 2. 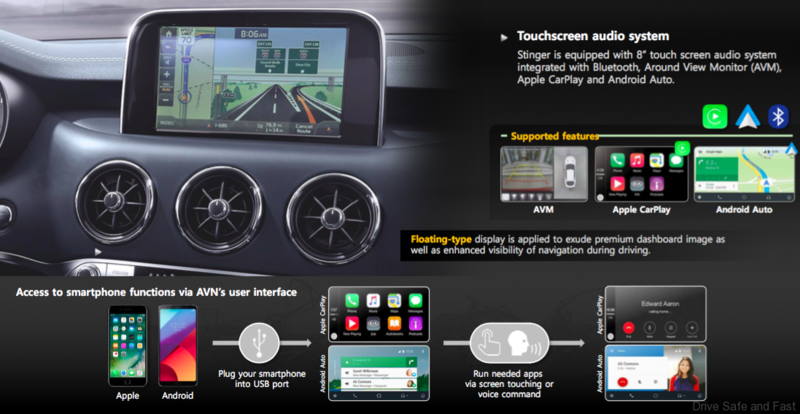 A crystal-clear 7-inch TFT LCD landscape cluster display sits between the gauge displays to relay performance data such as cornering G-forces, lap times and engine-oil temperature (available for 3.3L GT variant only), along with ancillary information such as the trip computer, driver settings, navigation and diagnostics. 3. 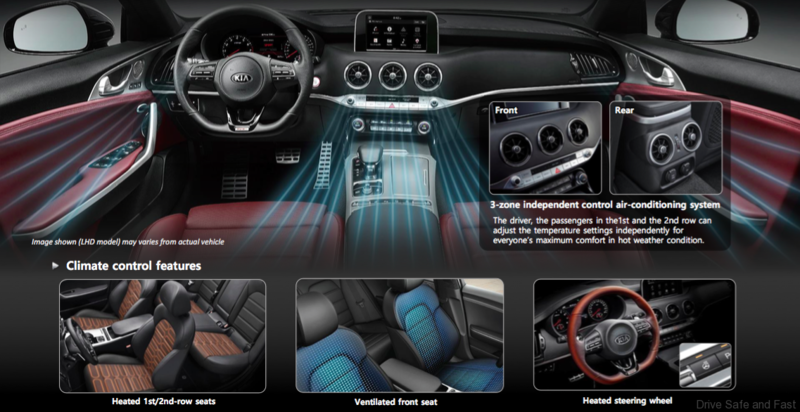 The center console is intuitively split into two specific areas: the infotainment system and an 8-inch floating navigation touchscreen integrated with Bluetooth, Apple CarPlay and Android Auto, while climate and ventilation controls nestle beneath. 4. 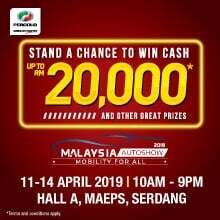 Industry-leading safety features include Hill-Start Assist Control (HAC), Antilock Braking System (ABS), Traction Control System (TCS) and Cornering Brake Control (CBC), Blind-spot Collision Warning (BCW), Rear Cross-Traffic Collision Warning and 7 airbags. 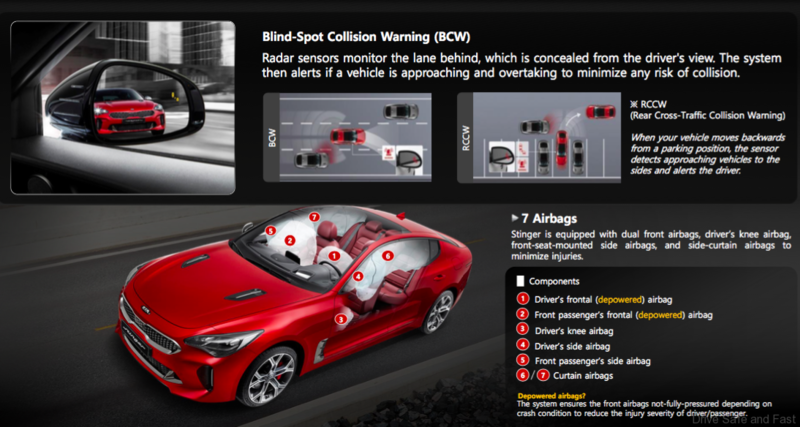 Due to its advanced safety technologies, the Kia Stinger received the highest rating of 5 stars from Euro NCAP. 5. 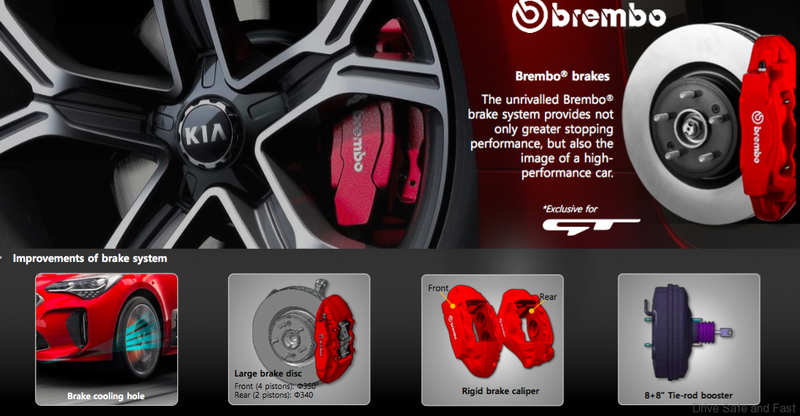 Stopping power comes from standard high-performance Brembo® disc brakes featuring quad-piston front calipers and dual-piston rear calipers. The lightweight monobloc all-aluminium calipers reduce unsprung weight and are coupled with large diameter brake discs (13.8-inch front and 13.4-inch rear) that quickly dissipate heat and help to deliver short stopping distances. 6. 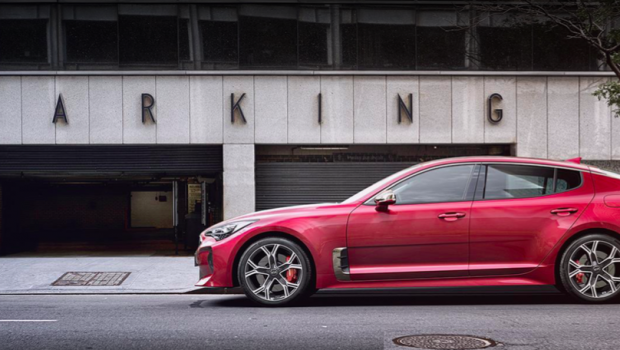 Refined on the legendary Nürburgring circuit, the Kia Stinger proved its mettle to handle even the most demanding road conditions with composed poise, contributed by the Vehicle Dynamic Control (VDC) that features the sophisticated Dynamic Torque Vectoring Control system. With 73 corners, nearly 1,000 feet of elevation and 17% gradients, the “Green Hell” can chew up and spit out a car of lesser mettle in just one lap. 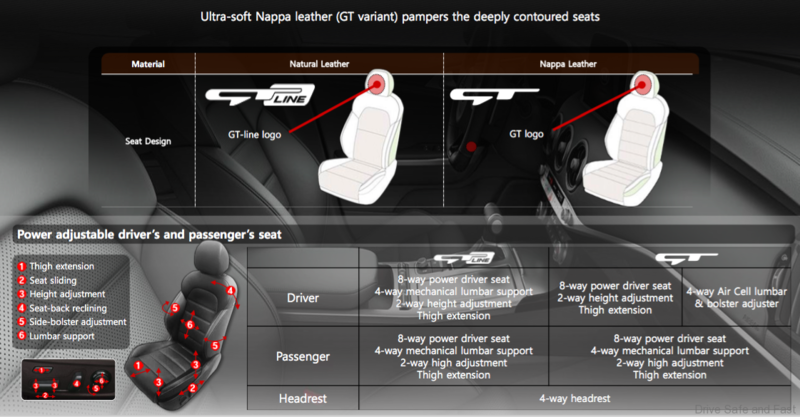 Kia’s engineers put every development Stinger through a minimum of 480 laps (equivalent to 6,214 miles) of high-stress driving around the Nordschleife for quality, reliability and durability testing. The constant combination of hard acceleration, rapid deceleration, heavy cornering, changing surfaces and camber offers an unrivaled test of dynamic prowess and the distance covered during the Stinger’s development resulted in nearly 100,000 miles of on-road testing. 7. The bodywork was tapered slightly towards the rear of the car and new ‘gills’ were introduced behind the front wheel arches, each serving to reduce wake turbulence as air passes over the car’s flanks. A partially-flat underfloor cover flowing into the rear diffuser reduces drag under the car, while the rear spoiler was modeled with a slight ‘ducktail’ shape, reducing lift and increasing high-speed stability. At the front, large horizontal cooling ducts were introduced to optimize brake cooling, and air inlets are shaped to reduce front-end lift. 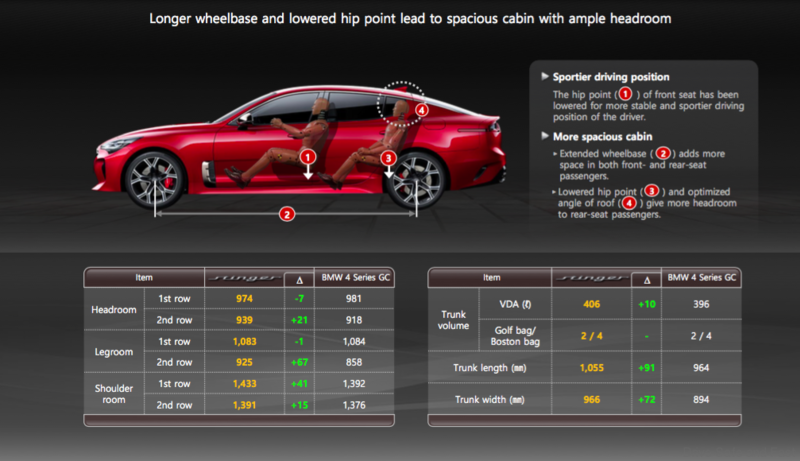 Finally, Kia’s aerodynamicists found that reducing the height of the rear of the roof enhanced the fastback’s ‘aerofoil’ shape and improved the Stinger’s aerodynamic efficiency at the same time. The result is a drag coefficient of 0.30 Cd. 8. 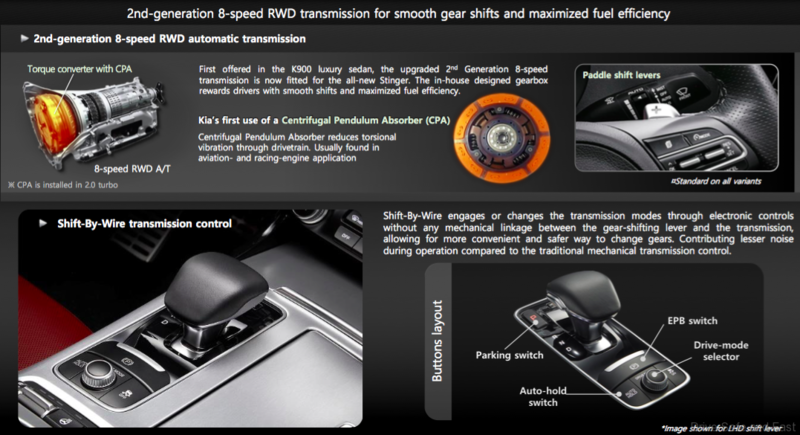 The gearbox can be set to intuitively manage shifts on its own or selectively run through the gears via paddle shift levers mounted behind the steering wheel. 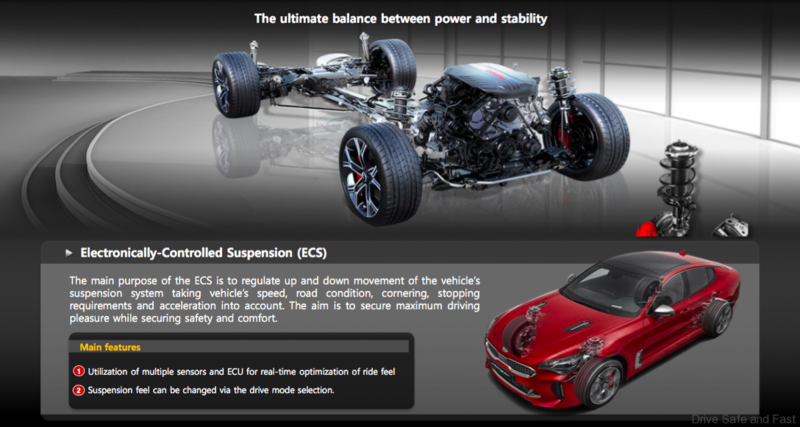 As with the suspension and steering, the Stinger’s rear-wheel drive system is fully integrated with its 5-Drive Mode, offering distinct calibration between comfort and sport modes. 9. 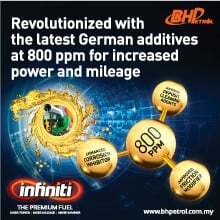 The 2.0L twin-scroll turbocharged four-cylinder Theta II T-GDi engine produces 251 horsepower at 6,200 rpm with 353Nm of maximum torque available from 1,400 – 4,000 rpm, propelling the Stinger from 0 to 100km/h in just 6.0 seconds. 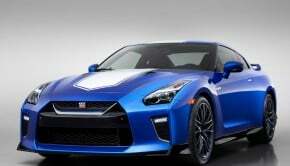 Performance credentials are further enhanced through the 3.3L twin-turbo V6 Lambda T-GDi engine, which sees the racehorse accelerating to 100km/h in 4.9 seconds with its 365 horsepower at 6,000 rpm and offers 510Nm of torque from 1,300 – 4,500 rpm – ultimately proving itself to be a worthy challenger to the competition. 10. 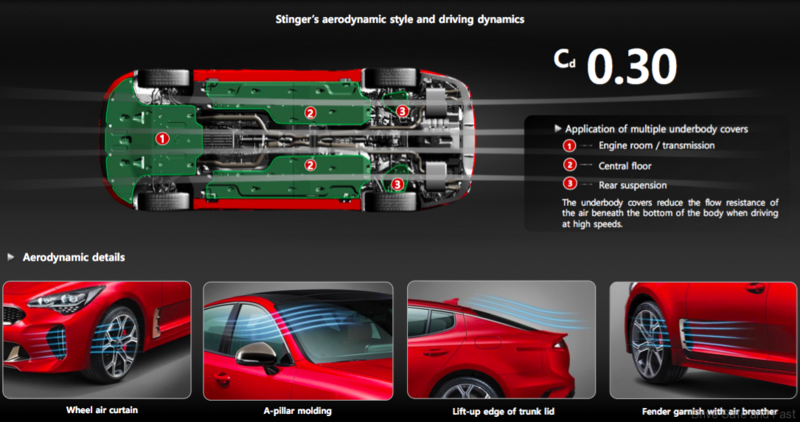 At 114.4 inches, the Stinger’s wheelbase is longer than the Audi A5 Sportback, Infiniti Q50, Lexus IS, BMW 4 Gran Coupe and the Lexus GS. 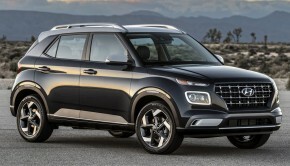 It’s also longer overall (190.2 inches) and wider (73.6 inches) than several others in the segment. With a generous 406-liters of cargo space, the Stinger’s cargo area is also larger than many of its competitors, with enough space for full-size luggage or golf bags and a power liftgate with Smart Trunk functionality is available. 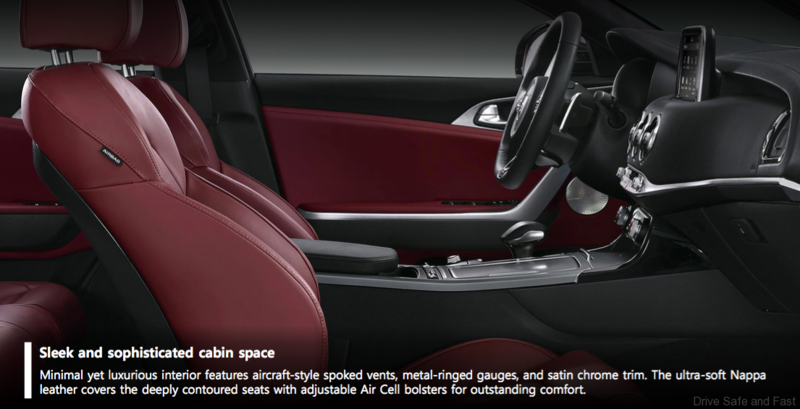 The spacious accommodations provide more interior volume than its competitors, including the BMW 6 Series Gran Coupe, 4 Series Gran Coupe, Audi A5 Sportback, and the Lexus GS. 11. Aeronautically inspired spoked circular vents are found front and rear and a tasteful satin chrome ring encircles the cabin. The effect is a feeling of cocooned intimacy, enhanced with warm and inviting available multi-color LED ambient lights that softly illuminate the finely crafted interior. 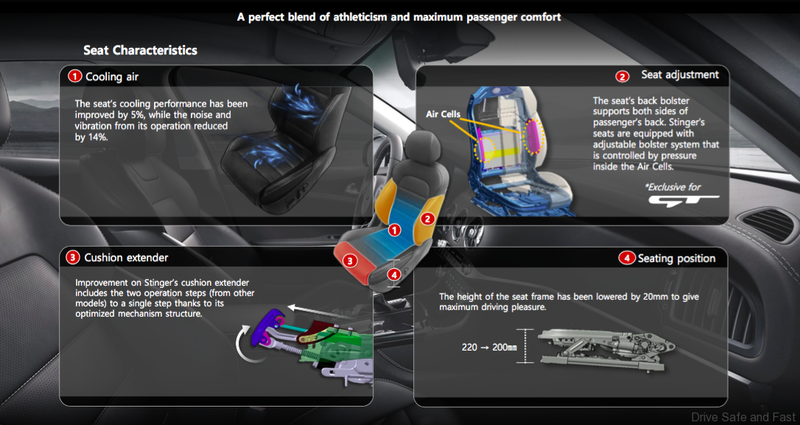 The long wheelbase allows for generous front and rear leg room and the low seating position provides ample head room front and back. 12. 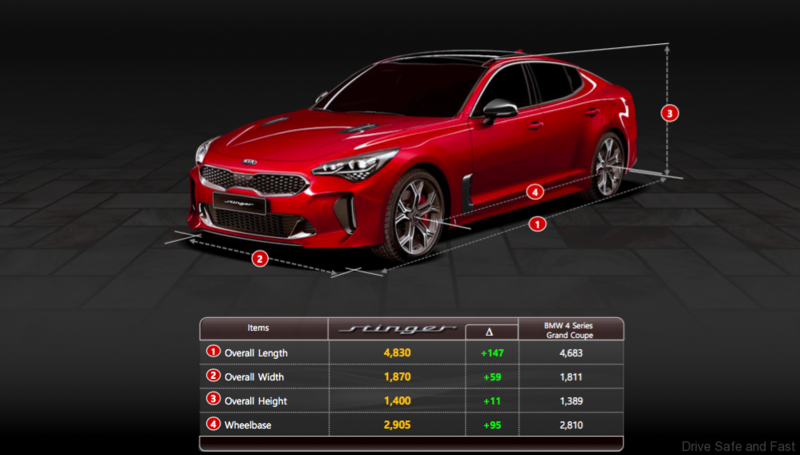 The KIA Stinger’s debut stunned many on the international arena, in a segment conquered mostly by German and Japanese makes. 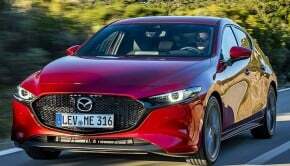 Since its introduction to the world in August 2017, the Kia Stinger has clinched numerous global accolades from prestigious names of the industry, such as ‘Best of the Year’ & ‘Best Sports Sedan’ in MotorWeek’s 2018 Drivers’ Choice Awards, Roadshow By CNET Shift Award For 2018 Vehicle Of The Year, Wards 10 Best Interiors for 2018, AutoGuide 2018 Car Of The Year, Autotrader’s 10 Best Car Interiors under USD50,000 for 2018 and many more.